Blade thickness (near tip): 1.09 in. 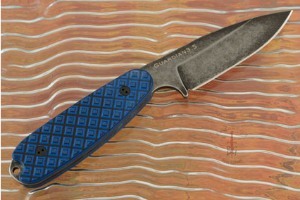 The Guardian 3.5 is based on the Guardian 3, but with a longer 4 finger handle and a choil-less design. 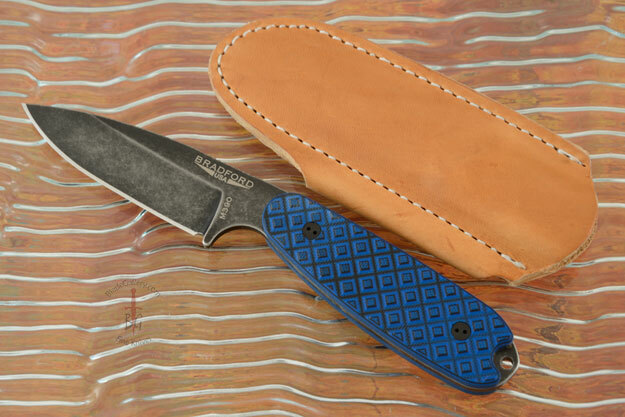 This compact fixed blade is designed to handle the work load that might typically fall upon a heavy duty everyday folder. 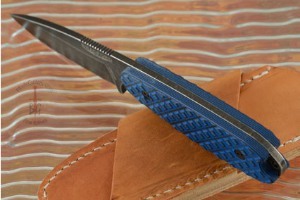 The blade is made from Bohler M390 stainless steel with a double temper and cryo treatment for exceptional edge holding. It has a Nimbus finish with a sabre grind. To create the Nimbus finish, the blade first received a DLC coating and then is tumbled the same way the stonewash finish is created. This creates a non-reflective surface that also hides scratches. Black and blue G10 scales are heavily diamond textured to offer a secure grip without being abrasive. 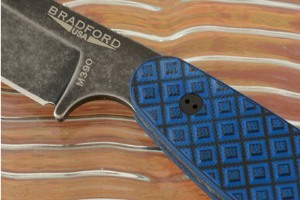 The handle fills out the hand comfortably and offers a variety of grip options. A tapped hole at the end of the handle makes it easy to add a lanyard.